There isn't anything super innovative about this recipe, but I will say that it is one of my originals. 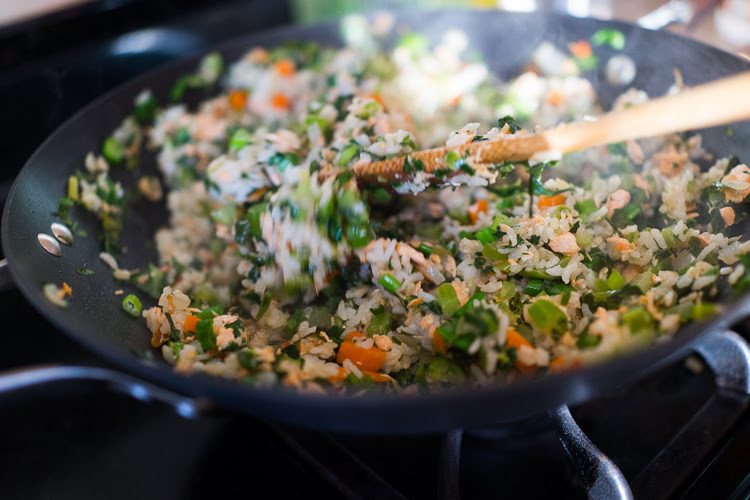 I don't really remember how I came up with it, but I remember that Wes was thoroughly enamored with this rather homely fried rice, in a way that I have never seen him with anything else that I've cooked before. He even mentioned this dish in his wedding vows, in front of all of our guests. 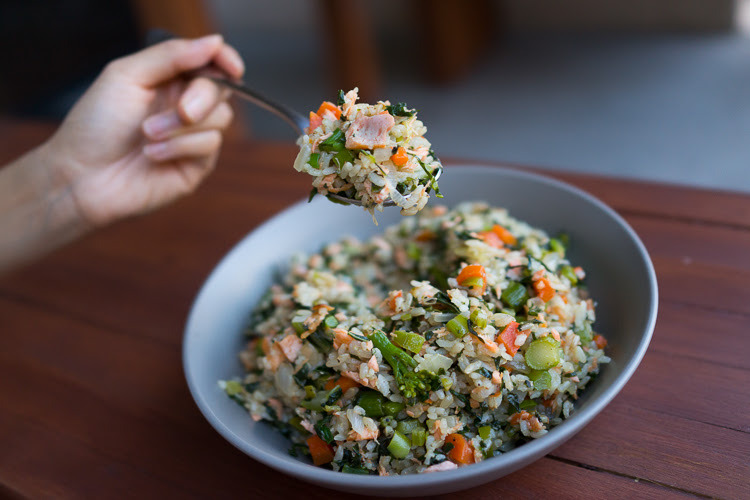 A recipe that sprouted out of nowhere has now become one of my go-to comfort food recipes. 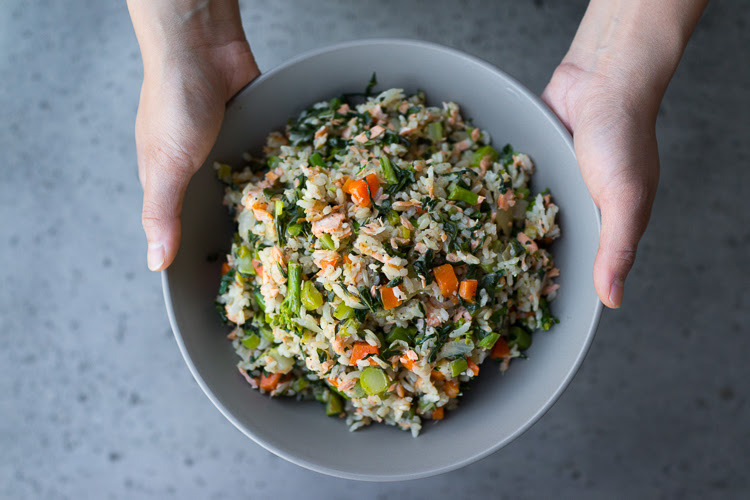 Being the veg-head that I am, this fried rice is almost more green than it is white (and a great jaw workout with all those Chinese broccoli stalks). I guess this is one way to get a boy to eat his greens. 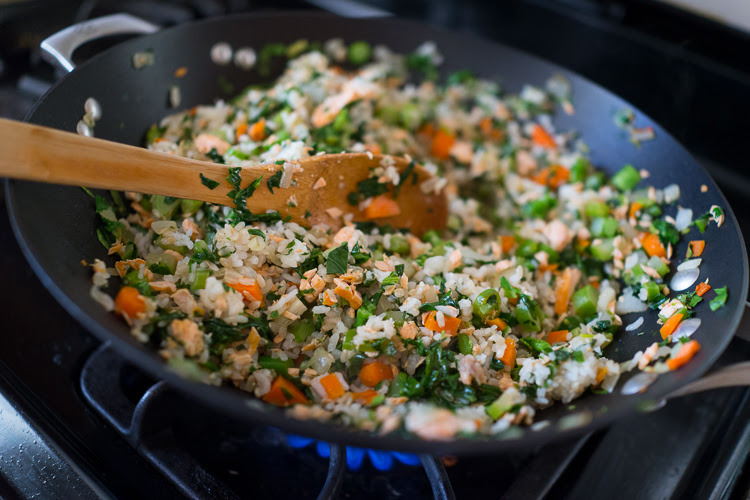 Sometimes I also sneak in brown rice, which is barely noticeable when there are so many other textures going on. 1. Cook the rice as you would normally. I never plan far enough ahead to have day-old rice, but I am able to achieve a drier texture by leaving the rice exposed after it is cooked to let it air out a bit. 2. Roughly chop everything into 1/4" pieces, except for the salmon. The leaves of the Chinese broccoli don't need to be perfectly chopped - they'll shrivel up. 3. 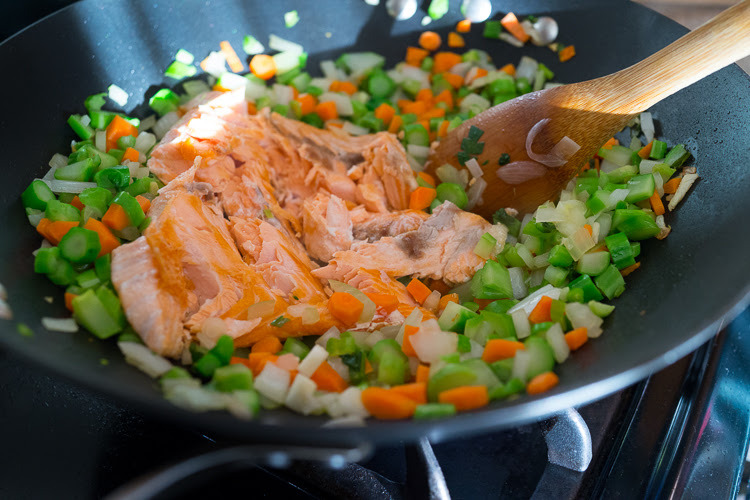 Add about a tablespoon of oil into a wok on high heat and lay the filet of salmon in when the oil is hot. 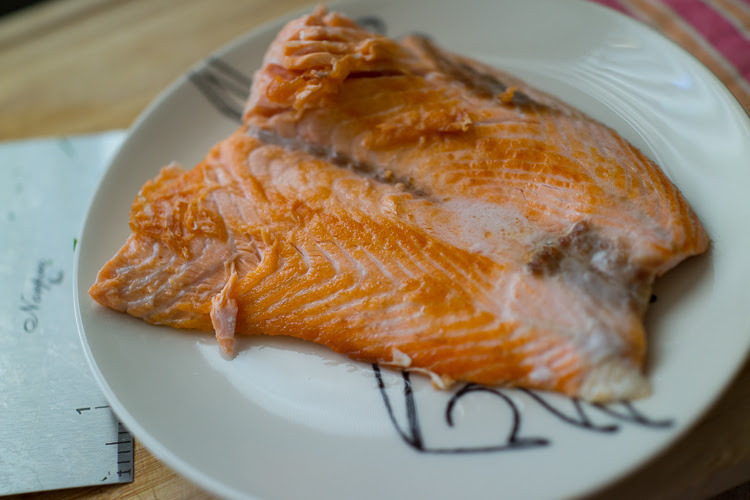 Let the salmon brown, but it doesn't need to be cooked through - about 2 minutes on each side. Add salt over the filet while it is cooking. 4. Remove the filet from the wok and set it aside. 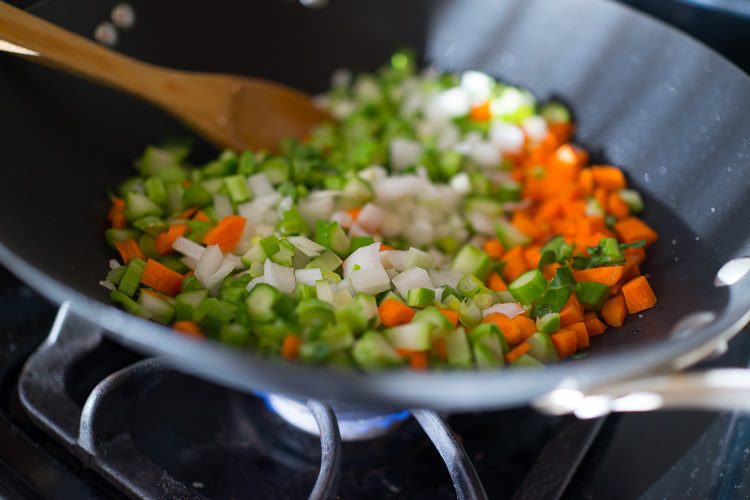 Add the white onion, white parts of the green onions, Chinese broccoli stems, and the carrots into the empty wok. Stir fry in remainder of salmon oil for about 5-7 minutes. 5. 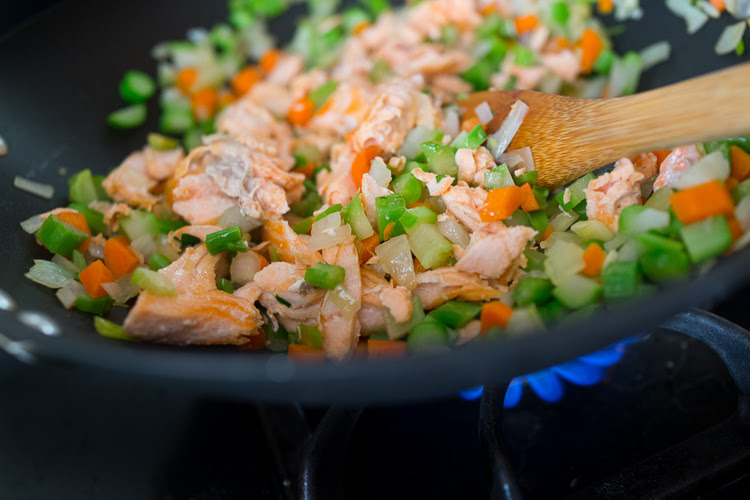 Add the salmon back in and break it up coarsely with a wooden cooking spatula. 6. 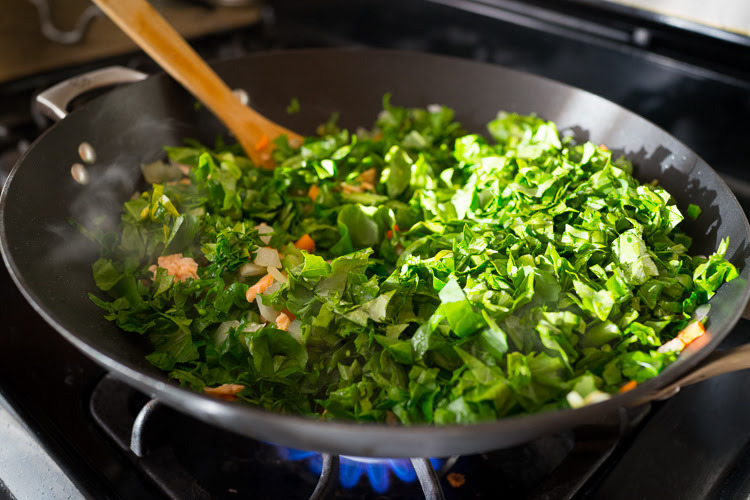 Add the leafy parts of the Chinese broccoli. Stir fry everything together for about 3 minutes. 7. 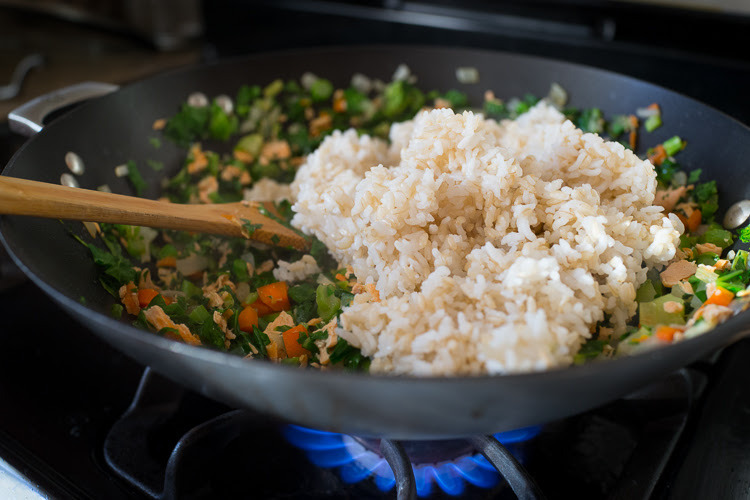 Add the rice into the wok and combine well. You may want to lower the heat to medium high. 8. 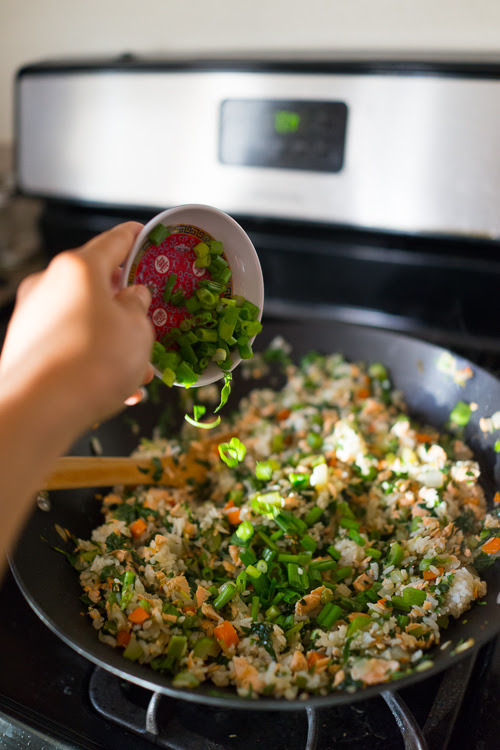 Add in the chopped green parts of the green onions. 9. Season with salt, black pepper, and white pepper. 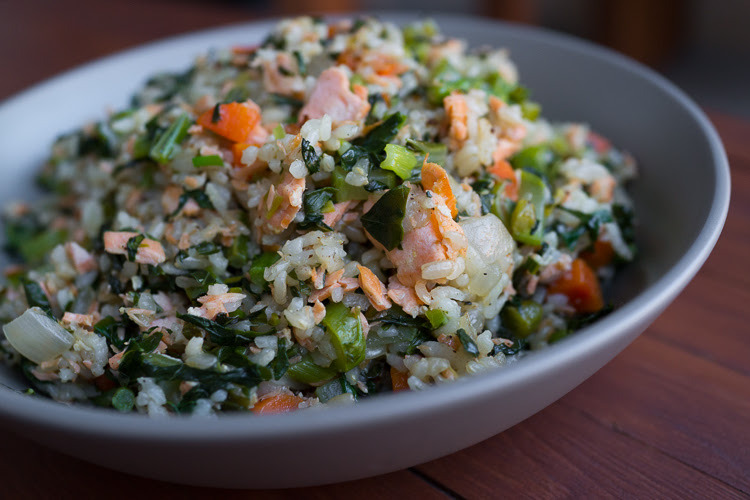 Ah, and by the way, I was really not going to blog about this rather straightforward recipe, but we wanted to test out our new Sony RX1 camera. The chunky Canons that brought us together will never be replaced by this sly one, but we got the new camera (well technically it was used - Wes found it on Craig's List) as a more portable and lightweight option for travel photos. Is it not disturbing that these photos look almost like one of our DSLR's took them, though? !